Hi. You are looking at a used Pioneer CLD-S201 laser disc player. There is 2 used movies When We Were Kings and Mobsters. A brand new sealed What Eating Gilbert Grape. Please review listing before bidding. 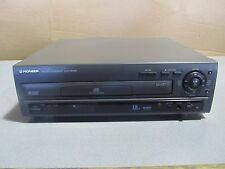 OEM Pioneer CLD-V5000 CD CDV LD LaserDisc Player CLD V5000. Laser Disc Player has been tested onsite and is guaranteed fully functional. Unit has scuffs and scratches from previous use and handling. Photos of actual item for sale. Includes unit only. Ready to ship today! Please feel free to message us with any questions you may have..
Has been tested with a laser disc and is working properly. Up for sale we have a Pioneer LD-V2200 Laservision Laser Disc Player w/ Lot of 40 Laser Discs. What you see in the pictures is what you get. Type: Laser Disc Player. Condition: Used. Model: LD-V2200. Pioneer karaoke machine working condition. I’ve tested the machine with both a cd and an ld everything works as it should. The disk shown in the photos is also included. This laserdisc player is used but has been tested and works. The bottom right corner has a ding. Let us know what we can do to assist you further. No exceptions. I AM NOT PERFECT BUT ONLY HUMAN. DOESN'T WORK. PIONEER CLD-S250 CD CDV LD PLAYER LASERDISC * Direct CD Tray * Includes Remote. Tested and fully functional. Multi-Play CD, CDV/LD Player LaserDisc. Pioneer Multi-Player & Remote in Perfect, Excellent Working Condition. Lightly Used, Original Owner. See Photos. No Batteries Included. BMB KARAOKE CD GRAPHICS DECODER DISC PLAYER MODEL CD-G100. 3 Video inputs for different video background superimposing. TESTED AND IS IN WORKING CONDITION. This Pioneer CLD-V5000 is fully functional and in excellent working condition. There is minimal wear on the body from normal use, as shown in pictures. It does not affect the functional integrity of the laser disc player whatsoever. This is in As Pictured Physical Condition. Up for sale is my Pioneer CLD-3070 CD CDV LD Laser Disc Player. System is alittle dusty on top but works great! I just tested it and watched Sleepy Hallow. No Remote. Great player. Im original owner. There are scratches and scuffs The face is very clean. The display is glossy, clear and bright. check photos for more details. Unit has been fully tested and all functions and features appear to work properly Puts out nice clear sound! Used Pioneer CLD-2070 LaserDisc Player In Nice Shape. Works Just Fine. Occasionally, when opening the tray, the player will suddenly shut itself off. Just turn the player back on and eject the tray again. I will double box for safe arrival. For sale is a rare Pioneer CLD-V700 model LaserDisc and CD player from early 1990. The LaserDisc player is in nice, clean physical condition. The front of fascia itself is in great shape. Manufactured in Feb of 1990, obscure model! OEM pioneer DVD LD player model no. DVL-919 "used"
OEM pioneer DVD LD player model no. DVL-919 "used". CLD 3030 plays all sizes, has multiple video enhancements like one shot memory, various digital effects. Was working fine then when not used for a long period isn't playing now reason unknown. Could be good for parts or perhaps it's a quick fix who knows. Remote included . No cosmetic flaws one owner well cared for. Up for sale is a Magnavox Multi Laser Disc Player WRV 100. It has been tested and is working properly. Included with the Magnavox WRV 100 is an attached power cable.No remote or any other accessories included. To cover has few light scuffs. Side wood panels has few light scratches but nice & shiny. I will double box for safe arrival. Works & looks excellent. Remote & manual included. Up for sale is Pioneer CLD-V740 Karaoke LD/CD Multi Laser Disc Player. Fully Tested Great Working Condition. Pioneer LD-V4400 Laser Vision LD Laserdisc Player. LaserDisc Player. optional LD-ROM compatibility. optional Remote (RU-V103). Pioneer Laser Disc Player model LT-D4400 in good condition. Used in good shape,has been checked out and laser cleaned. Has scuffs on top and small chip on bottom back corner of wood siding. Pioneer CLD-V740 Karaoke LD / CDV / CD player! Made in Japan! TESTED & WORKING! GREAT CONDITION WITH MINOR WEAR! We tested this laserdisc player with a new disc. The new disc was loaded and began spinning with no issue. We were not able to see any video output on our TV while the disc was playing. We do not take debit or credit. Pioneer CLD-V740 LaserDisc Player Used, but in good condition. Tested, and in perfect working order. (SEE PICTURES). The face is mostly clean, the knobs are present, all of the illumination works, and the buttons function as they're supposed to. 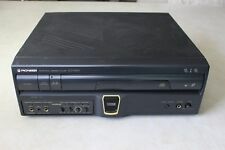 Have a sony mdp-mr1 laserdisc player suntech Chinese & English caption decoder 6 laserdisc movies. tested and everything works perfect. the laser disc player is in amazing condition. took off the top and no dust inside at all, just wow, amazing. Up for your consideration is a Pioneer CLD-990 Laserdisk Player. This item works very well. Plays the disks I have with no issue at all. Does not come with any AV Cables or remote control. The feet of the player does not have any screws to attach them to the player. 1983 MAGNAVOX MAGNAVISION REMOTE LASERDISC PLAYER CLEAN POWERS UP LID OPENS REMOTE WORKS. Includes LaserDisc player and its components. Bonus LaserDisc Movie.